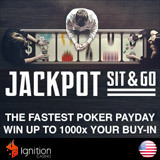 Ignition Poker Jackpot Sit & Go tournaments have been launched just in time for the holiday season. USA poker players can now play the popular jackpot SNG game on their favorite online poker site. 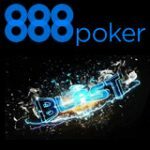 Buy-ins range from just $2 up to $30 and allows players to win up to 1,000 times their buy-in amount in just a few minutes. If you're new to playing Jackpot SNG tournaments we've included all you need to know about playing the game and it's jackpot payout. USA poker players can signup and get a welcome bonus up to $2,000 when making a first deposit at Ignition Poker. 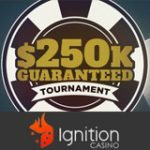 The Ignition Poker Jackpot Sit & Go Tournaments are three player, No-Limit Texas Holdem Poker hyper turbo tournaments with three minute blind levels, players receive a starting stack of 500 chips. Once three players have registered for a tournament the tournament will begin and a random prize pool multiplier will be generated from the spinning reels. Players will know what the prize pool will be just before they are dealt their first hand. 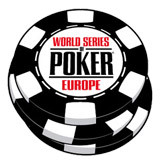 The prize pool multiplier can anything from 2 times up to 1,200 times the buy-in amount. Login to the poker lobby and click on Jackpot Sit & Go. 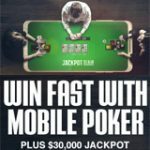 Choose the buy-in amount either $2, $7, $15 or $15 then select how many tables you wish to play, players can play up to four tables at the same time. Once registered the game will began as soon as the third player joins the table. 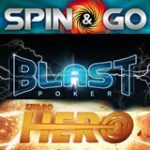 The spinning jackpot reels will determine the prize pools amount just before players are dealt their first hand. The random jackpot multiplier could be anything from 2x to 1,200x the buy-in amount. 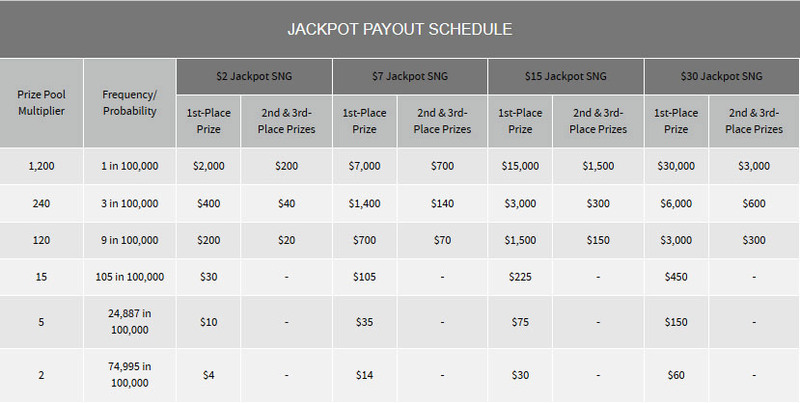 The maximum jackpot prize pool is $36,000 with a 1,200 multiplier at the $30 buy-in level. 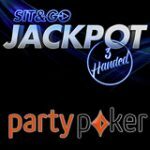 Is there rake for Jackpot SNG tournaments? There is no set rake and the house takes 7% of the buy-in amount. 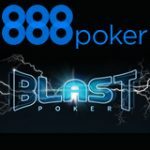 Being a hyper turbo SNG tournament with increasing blinds every three minutes, game-play is fast and only lasts a few minutes.